When a former president likes your shoes, you've totally made it in life. When we think of a Clinton heavily invested in fashion, it's usually Clinton Kelly, star of TLC's "What Not to Wear" -- not the 42nd president of the United States. But hey, even Bill Clinton has to appreciate a nice set of shoes from time to time. 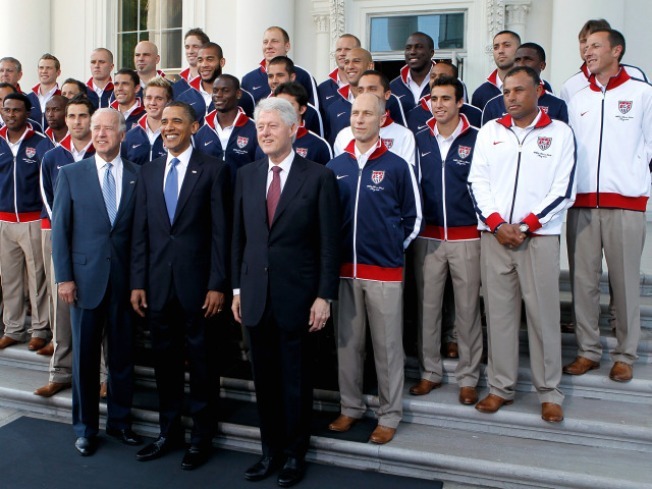 He, along with President Barack Obama and Vice President Joe Biden, greeted the U.S. World Cup soccer team at the White House today. "I want to be on this team just for the shoes," Clinton said about the particularly snazzy light brown footwear of the players and coaches. "This is the only team that I've ever seen that had these cool shoes." Biden and Clinton arrived before Obama, who was still at a Rose Garden celebration of NCAA men's basketball champ the Duke Blue Devils. But once Obama arrived, he agreed with Clinton. "This is the best dressed soccer team I've ever seen," he said. "Those are some sharp shoes."